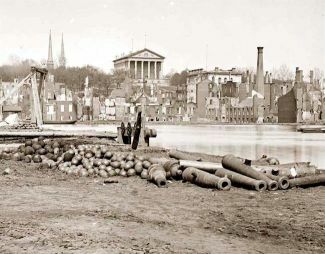 The Confederate capital of Richmond lies a mere 100 miles south of the United States capital of Washington, D.C. The distance is a bit deceptive, as Richmond is protected to the North and East by major rivers, swamps and marshes. Yet as the war drags on and the Union Army accumulates more victories and swells with recruits, Confederate leaders grow increasingly worried. Unrest in Richmond merely adds to the nervousness. Against this backdrop, Confederate President Jefferson Davis today declares martial law over Richmond and the surrounding area. The writ of habeas corpus and civil jurisdiction are suspended. The production and sale of alcohol, as well as intoxication, is outlawed. Union sympathizers are arrested, as well as Confederate deserters and persons deemed to be traitors, including a number of German residents and other immigrants. In August, Castle Thunder Prison opens in an effort to accommodate the swelling ranks of those arrested. While the Baptists of Richmond are appreciative of the prohibition against alcohol, the declaration of martial law in the long term results in many hardships and leads to greater uneasiness in the city. By the end of the war, President Davis’ large-scale use of martial law and cascading restrictions on civil rights throughout the Southern nation lay bare the pretension of a nation founded upon freedom and liberty.